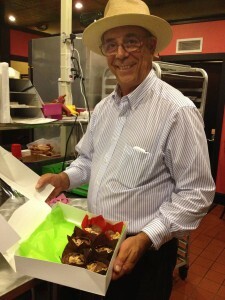 Chef Roux shows his delicious, sustainable chocolate cakes! In celebration of this bigger-than-ever event, we are proud to profile some of our sponsors. Their practices show the many ways there are to contribute to a healthier, more sustainable world right now. This week we meet Gateau O Chocolat. This St. Petersburg-based business was founded by Chef Emmanuel Roux in 2011. Chef Roux creates flourless chocolate cakes from entirely sustainable ingredients. The cake is not only delicious, but also healthy for customers and the environment. Rainforest Alliance chocolate. The Rainforest Alliance-certified, 100% single-origin, rare Ecuadorian chocolate is the key ingredient in this cake and it is gluten-free. It lays the base for everything Gateau O Chocolat is about. According to Green America, cocoa is a $16 billion industry each year. But cocoa farmers make between $30 and $110 per year, often working in horrendous conditions. Rainforest Alliance chocolate is verified as providing better working conditions for cocoa farmers. They also insure that the tropical rainforest is preserved while providing a sustainable living to its inhabitants. Organic ingredients. Other ingredients include organic eggs and butter from a well-known organic small farm cooperative. The cane sugar comes from Florida. These ingredients taste better and don’t have the residues of pesticides, herbicides and hormones of their conventionally-grown counterparts. Local and small businesses provide the ingredients for Gateau O Chocolat’s cakes. Purchasing from small businesses contributes to a more sustainable economy. Makes a delicious – and ethical – corporate gift! With the holidays coming, a chocolate cake makes a wonderful gift for corporate customers or employees. When not creating melt-in-your-mouth chocolate cakes, Chef Roux is also involved in Faith House, a transition home for people recovering from substance abuse. He runs an urban garden there which both helps to feed the residents and teaches them how to grow their own food. Chef Roux sees urban agriculture as serving several positive purposes at once, including recycling organic waste, reducing pollution from waste, promoting organic agriculture, and making fresh produce more available to all of us. It’s no surprise that Chef Roux sees his efforts and philosophy dovetailing with Sustany®’s. Both organizations are committed to making Tampa Bay a healthier, more sustainable community for all. Important Reminder! Volunteer for the 26th Annual Hillsborough River and Coastal Cleanup. It’s Saturday, September 21.